We arrived at 2 PM & the reservation lines were packed. Didn’t really have a choice as to which clerk we would get. We arrived at 2 PM & the reservation lines were packed. Didn’t really have a choice as to which clerk we would get. Originally booked two wheelchair accessible rooms online and it wouldn’t allow us to choose which tower we were in. We only wanted one wheelchair accessible room and one regular room but we were afraid it would be in 2 different towers so we just reserved 2 wheelchair accessible rooms online. Once I got email confirmation I saw that both rooms were in the Roman tower. Upon arrival to the hotel we had to wait in line about 20 minutes. As it happened when we got to the front of the line a male manager was standing in close vicinity to our clerk, So we were nervous to even try this. I instructed my husband put a $20 bill between his drivers license and the credit card and he handed it to the clerk and told her online it didn’t give us a choice of which tower we were in and would it be possible to upgrade our rooms. She said she would check and placed the $20 bill back on the counter in front of us. We also told her we only actually wanted one wheelchair accessible room but since we wanted to be in the same tower we couldn’t book it that way online. She typed for a few minutes and told us she had upgraded rooms available & told us she could put us in 1 wheelchair accessible deluxe room with 2 queen beds & 1 deluxe room with two queen beds, both in the Augustus Tower & just down the hall from each other. Both of the rooms were absolutely huge. Our room had a spa tub and a walk-in shower and had a beautiful view of the Bellagio fountains & the strip. The wheelchair accessible room was also huge and had a view of the other side of the strip, no bathtub, but instead a shower with a pulldown wheelchair accessible seat in it. Under the vanity there was another free standing portable wheelchair accessible seat that could actually be put in the shower or used to sit in front of the vanity. The first night all six of us ordered room service and sat looking out the full length window watching the Bellagio fountains! It doesn’t get any better than this! The clerk was excellent. We might have received the upgrade even without the tip but we decided to try it. We were in the back of the hotel and had a view of the Palms and Rio but we did not care about the view because the room was gorgeous. The Augustus Tower is amazing. The National Rodeo Finals and the Las Vegas Marathon were both this weekend and they even had a Convention with over 3500 employees so we were very happy to even get this. On a side note, the food credit could be used for room service and their Kung Pao chicken was awesome. Checked in at airport about 5.30pm. Handed credit card with tip visible to clerk and asked if there were any free upgrades available. She knew exactly what we meant and after a little time typing gave us a fantastic room over overlooking the Bellagio fountains. We were travelling with our young kids (shock horror!) and would probably have scored a suite if we did not need the 2 queen beds. He replied,”No, not really, just people coming to relax.” Blah, blah, blah…more small talk. Then I slid the CC over the $20 and hid it. I answered yes and that was that. “Is that for me?”, he asked pointing to the $20. I said yes and he smoothly took the cards and $20 and pocketed it. I dunno why he said he couldn’t do it at first. 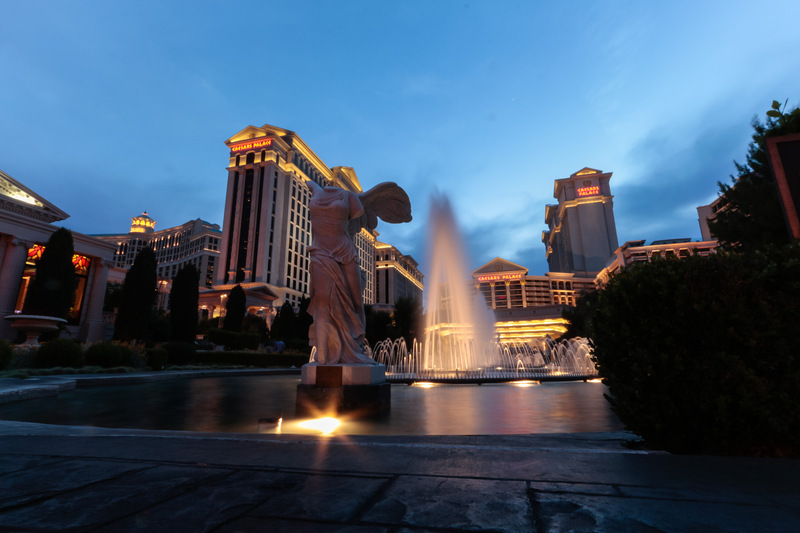 Stayed at Caesars from 8/8-8/11, checked in at the hotel, told the young girl that it was my friend’s birthday (it really was) and slipped her my CC and ID with $20 between and asked if there were any complimentary upgrades available. She seemed like she knew exactly what I was getting at, so she goes, “I’ll see what I can do.” Types away at the computer and finds us a room in the Palace towers overlooking the pool and right next to the elevator. It was great, had our own jacuzzi, and the pool was right downstairs. Very well worth the $20! I was hoping to get the Augustus Tower, but I guess I’ll just have to try again next time! Slipped $20 for a room at Cesars Palace and the young girl had no clue what I was trying to do. Told me that there wasn’t anything available and that the room i was getting was already nice. Felt pretty embarassed at the moment. Took my $20 back and thanked her and checked out the room. It was a newly renovated room with a LCD TV and very spacious in the palace tower. One of the nicer rooms I have stayed in Vegas, maybe even better than Venetian IMO. Came back from LV over the weekend. Checked in at the airport to Ceasars. The $20 trick worked…got upgraded to the suite with a huge his and her bathroom and a large LCD Sony TV. I would’ve gotten a better deal if not for the 2 queen beds. Anyway, when we got to the room, the bathroom door was broken and I complained at the check in counter. They told us that all of their rooms are full at 97.6% fill rate this past weekend and don’t have one similar to ours. So they comped us $50 for buffets and upgraded us to the Asparatus tower (1 year old) the following day. Nicer suite with a LCD TV in the bathroom. Not that it matters, but the checked in person was an African American and he seemed nervous when checking us in at the airport. He had to make a call to the hotel to make sure the suite we wanted was available. Oh did I mention that the room was comped at Ceasars? -$20 (tips) + $50 (buffets) = $30 slot money. Used airport check in (which also saved me about 45 minutes). Got a nice suite with a strip view. The guy in front of me nicely asked if there was anything available in terms of free upgrades and was told no… I guess in this case $20 worked better than a smile and being friendly. folded the $20, held between my knuckles. made sure clerk saw it and when i was satisfied with the upgrade we made a slick exchange. Took a little more work but finally got an amazing upgrade. They upgraded me from a standard room to Augustus Tower guest room with a view of the strip and the Bellagio fountain, on a high floor. Had all kinds of things sent up to my room as well like gifts, drinks and chocolate. What an amazing upgrade. I would say try this and if they give you a hard time really then push it to see what they can do. Oh and to get VIP dress well (Suit) tip generous and people will hand you VIPs like candy. Got plenty to PURE when I was at Caesars.